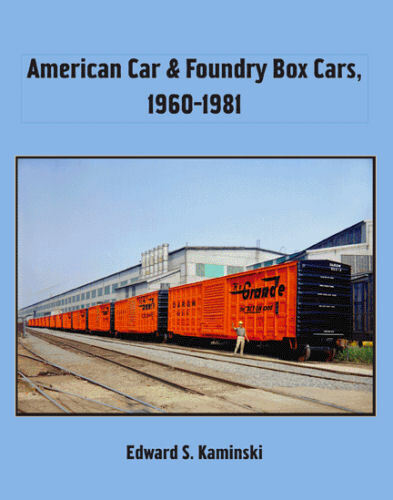 The last period of AC&F manufacturing of box cars was the years 1960–1981, and this volume provides both the history and extensive color photography, along with details of car design and construction in this period. Many colorful paint schemes were in use by railroads and lessors, large and small, and they are shown here, including many Incentive Per Diem schemes. A complete production roster of the box cars built is also provided. Coverage includes 40-foot as well as 50-foot inside-post cars, 50-foot outside-post cars, and 60-foot inside- and outside-post cars. Many of these 60-foot cars were built for auto parts service. Author Kaminski is an acknowledged authority on freight car history and has extensively researched AC&F records to write this account. Any modeler of the 1960s and ’70s, or freight car fan, will want this book. Hard cover.